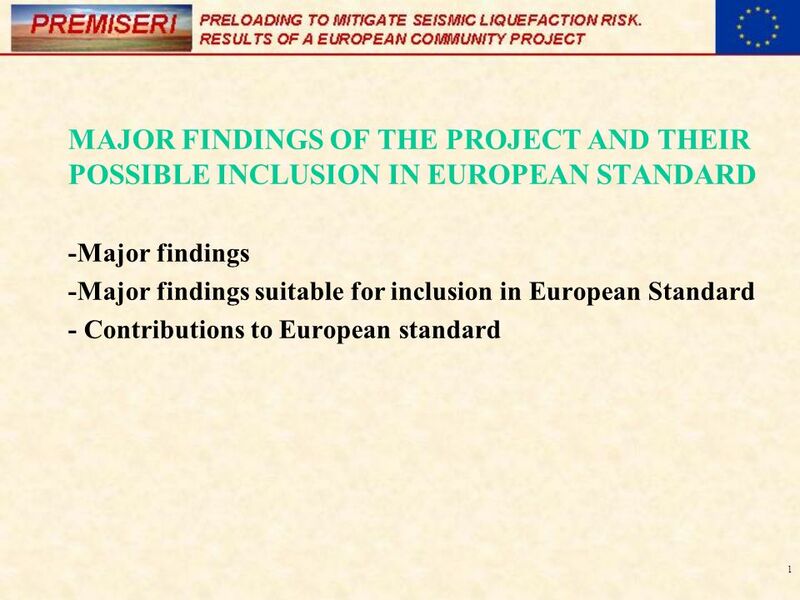 1 MAJOR FINDINGS OF THE PROJECT AND THEIR POSSIBLE INCLUSION IN EUROPEAN STANDARD -Major findings -Major findings suitable for inclusion in European Standard. 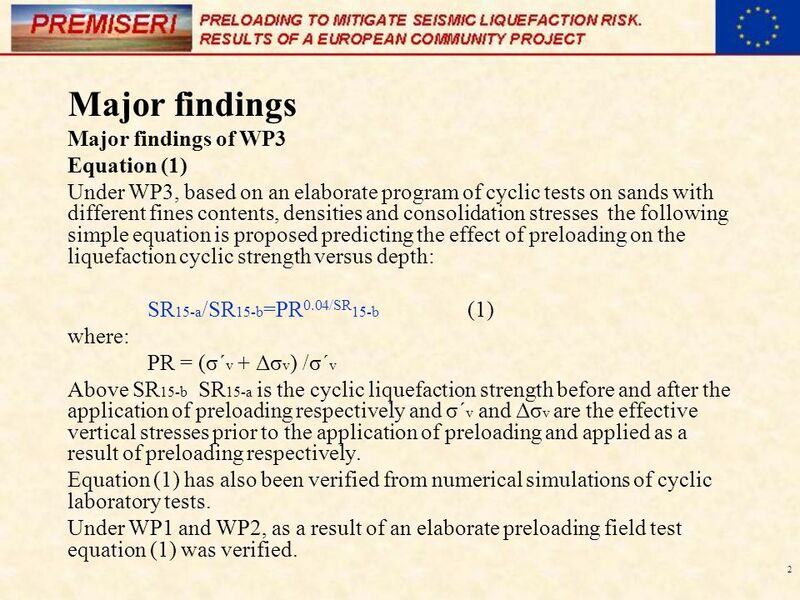 2 2 Major findings Major findings of WP3 Equation (1) Under WP3, based on an elaborate program of cyclic tests on sands with different fines contents, densities and consolidation stresses the following simple equation is proposed predicting the effect of preloading on the liquefaction cyclic strength versus depth: SR 15-a /SR 15-b =PR 0.04/SR 15-b (1) where: PR = (σ΄ v + Δσ v ) /σ΄ v Above SR 15-b SR 15-a is the cyclic liquefaction strength before and after the application of preloading respectively and σ΄ v and Δσ v are the effective vertical stresses prior to the application of preloading and applied as a result of preloading respectively. Equation (1) has also been verified from numerical simulations of cyclic laboratory tests. Under WP1 and WP2, as a result of an elaborate preloading field test equation (1) was verified. 3 3 Equation 2 The following equation was proposed and verified: FS (t-i) = 0.2 (σv (t-i) -P (t-i) ) / (A γe H t ) (2) where γ e is the unit weight of the clay layer and the embankment, H t is the time dependent height of the embankment, σ' v is the in-situ effective vertical stress that can be estimated from elastic theory, A is a factor that depends on the embankment height, layer thickness and inclination of the slope of the embankment as given in Fig. 1 and the subscript t indicates variation in terms of time and the subscript (t-i) indicates variation in terms of location and time. 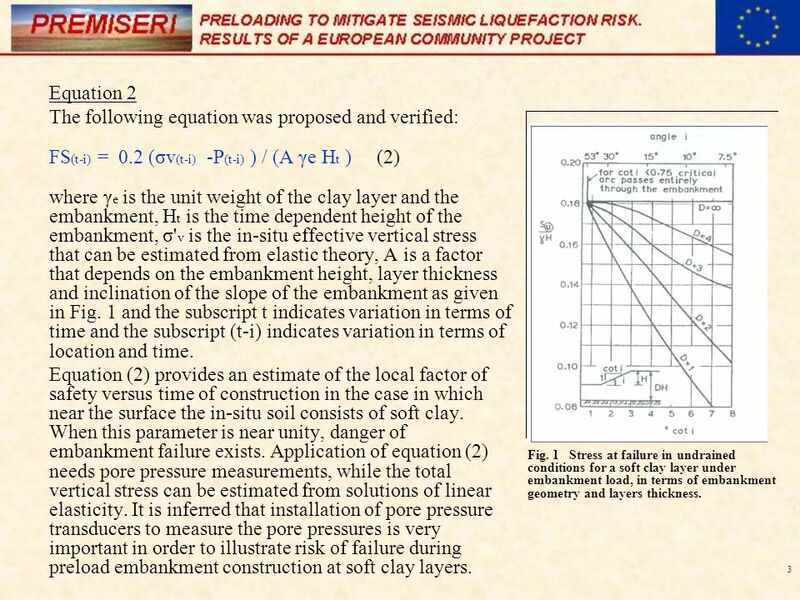 Equation (2) provides an estimate of the local factor of safety versus time of construction in the case in which near the surface the in-situ soil consists of soft clay. When this parameter is near unity, danger of embankment failure exists. Application of equation (2) needs pore pressure measurements, while the total vertical stress can be estimated from solutions of linear elasticity. 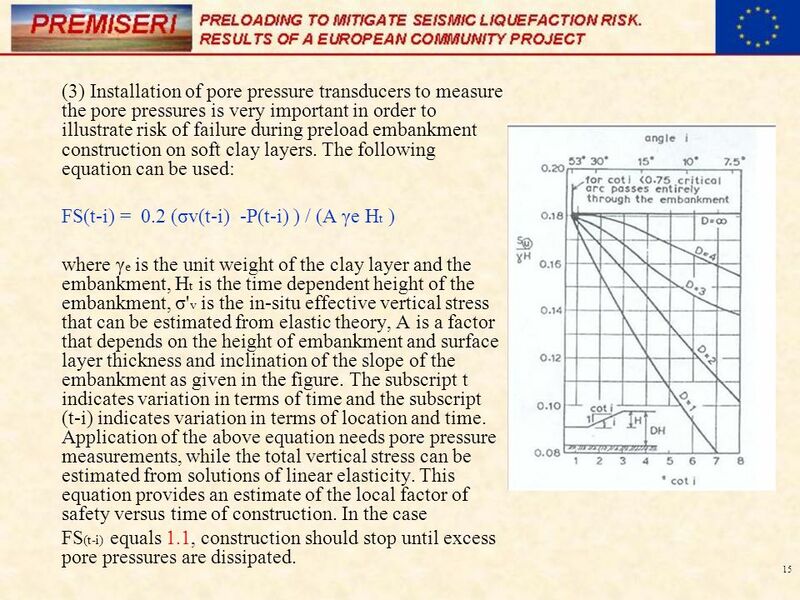 It is inferred that installation of pore pressure transducers to measure the pore pressures is very important in order to illustrate risk of failure during preload embankment construction at soft clay layers. Fig. 1 Stress at failure in undrained conditions for a soft clay layer under embankment load, in terms of embankment geometry and layers thickness. 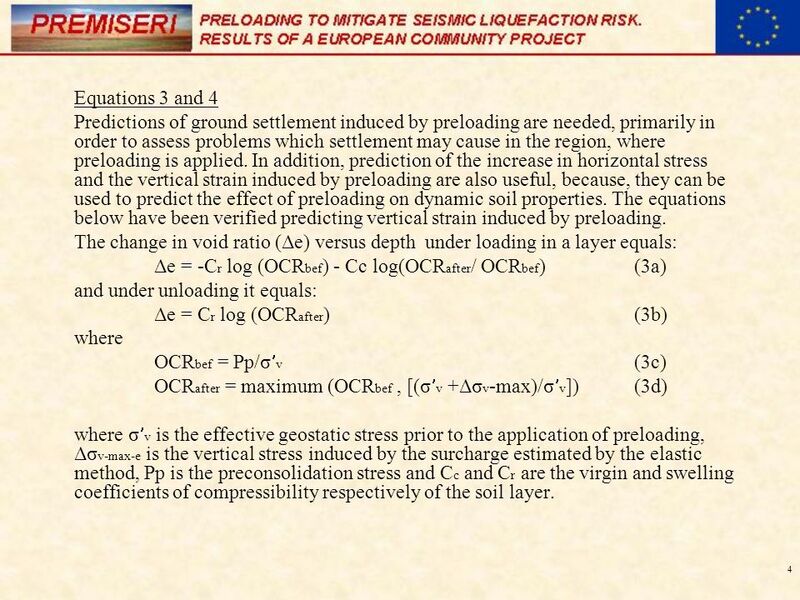 4 4 Equations 3 and 4 Predictions of ground settlement induced by preloading are needed, primarily in order to assess problems which settlement may cause in the region, where preloading is applied. In addition, prediction of the increase in horizontal stress and the vertical strain induced by preloading are also useful, because, they can be used to predict the effect of preloading on dynamic soil properties. The equations below have been verified predicting vertical strain induced by preloading. The change in void ratio (Δe) versus depth under loading in a layer equals: Δe = -C r log (OCR bef ) - Cc log(OCR after / OCR bef ) (3a) and under unloading it equals: Δe = C r log (OCR after ) (3b) where OCR bef = Pp/σ v (3c) OCR after = maximum (OCR bef, [(σ v +Δσ v -max)/σ v ])(3d) where σ v is the effective geostatic stress prior to the application of preloading, Δσ v-max-e is the vertical stress induced by the surcharge estimated by the elastic method, Pp is the preconsolidation stress and C c and C r are the virgin and swelling coefficients of compressibility respectively of the soil layer. 5 5 Finally, the change in void ratio can be related under 1- dimensional conditions to the change in vertical strain Δε as : Δε= Δe/(1+e) (3e) Mayne and Kulhaway (1982) empirical relationship predicts the coefficient of lateral pressure at rest (k o ) in terms of the overconsolidation ratio (OCR) and the friction angle (φ ) as: k o = (1 - sinφ ) OCRsinφ΄ (4a) Using eq. (4a), the residual change in horizontal stress (Δσ h-res ) can be estimated as: Δσ΄ h-res = (1 - sinφ ) σ v (OCR after sinφ'- OCR bef sinφ΄)(4b) The equations below have been verified predicting the initial horizontal stress and its change in horizontal effective stress induced by preloading. 8 8 Major findings of WP4 Under WP4, equation (1) that relates improvement of cyclic strength to preloading ratio was validated using data from previous applications of preloading in the field. In particular, field SPT, CPT and Vs measurements before and after the application of preloading were used. 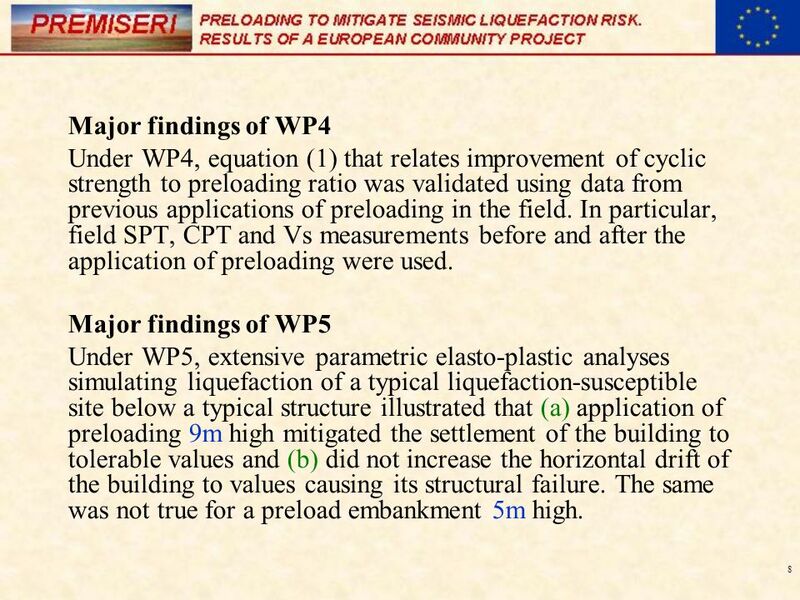 Major findings of WP5 Under WP5, extensive parametric elasto-plastic analyses simulating liquefaction of a typical liquefaction-susceptible site below a typical structure illustrated that (a) application of preloading 9m high mitigated the settlement of the building to tolerable values and (b) did not increase the horizontal drift of the building to values causing its structural failure. The same was not true for a preload embankment 5m high. 9 9 Major findings of WP6 Under WP6 proposals to simulate the effects of preloading on the amplification of the seismic motion based on extensive parametric analyses are given. In particular, the following equation has been proposed a max-t / a max-t-h=0 = - h A +1 (8a) where a max-t, a max-t-h=0 is the maximum acceleration after and before preloading respectively, h is the height of the preload embankment in m and A is a factor given in table 1 in terms of type and depth d b of the soil layer. Furthermore, for liquefaction analyses, it is proposed that the decrease of a max induced by preloading should vary linearly from the surface value to zero at depth equal to 3.5m. The above can be expressed in mathematical form as: a max-a /a max-b = 1 - (A h ) (3.5 - d) / 3.5d<3.5m(8b) a max-a /a max-b = 1 d>=3.5m Equation (8) was compared to predictions of Eurocode by modifying the shear wave velocity due to preloading using equation (5) that gives the ratio of velocities as a function of the ratio of e, OCR and k o linear expressions and was found to have similar trends and not to differ considerably. 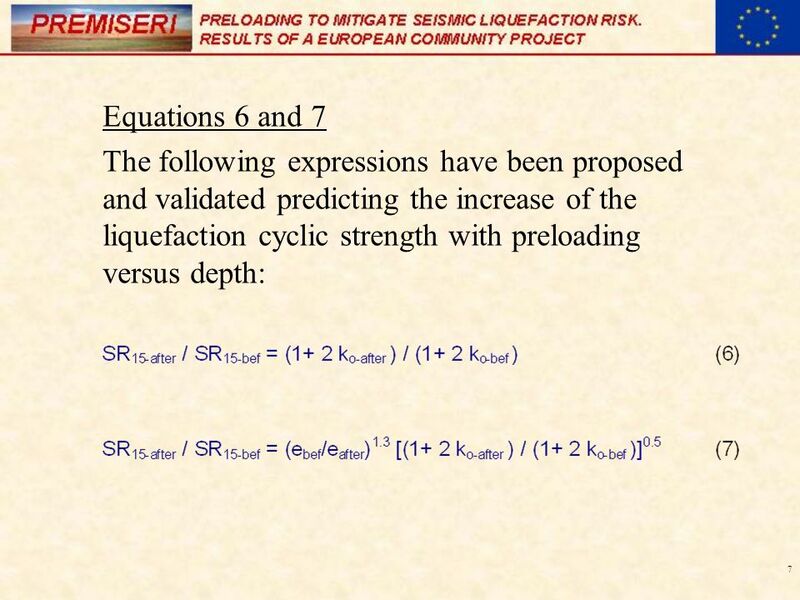 10 10 Major findings suitable for inclusion in European Standard Equation (1) predicting the effect of preloading on the liquefaction cyclic strength has been thoroughly validated and is very simple to apply. Thus, equation (1) should be included in Eurocode. As the field test illustrated, the check against stability failure during the application of preload is important and should be applied. Thus, equation (2) should be included in Eurocode. The shear wave velocity versus depth is a very important parameter of Eurocode because it determines the factor Vs, 30 from which the design acceleration spectrum is determined (European Standard, 2003). 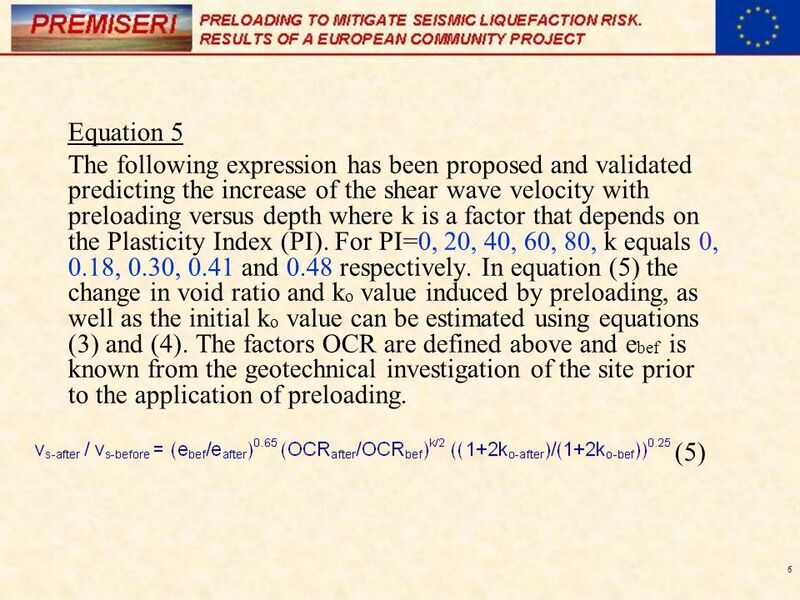 It is inferred that equation (5), that illustrates the effect of preloading on the shear wave velocity versus depth should be included in Eurocode. As equation (3) and (4) are needed to apply equation (5), they should also be included. 11 11 The finding under WP5 that (a) a preloading 9m high mitigated the settlement of the building to tolerable values and (b) did not increase the horizontal drift of the building to values causing its structural failure and that the same was not true for a preload embankment 5m high is very useful but not general since it was derived for a particular only soil type and specific properties assigned to it and should not be included in Eurocode. 12 12 Contributions to European Standard. 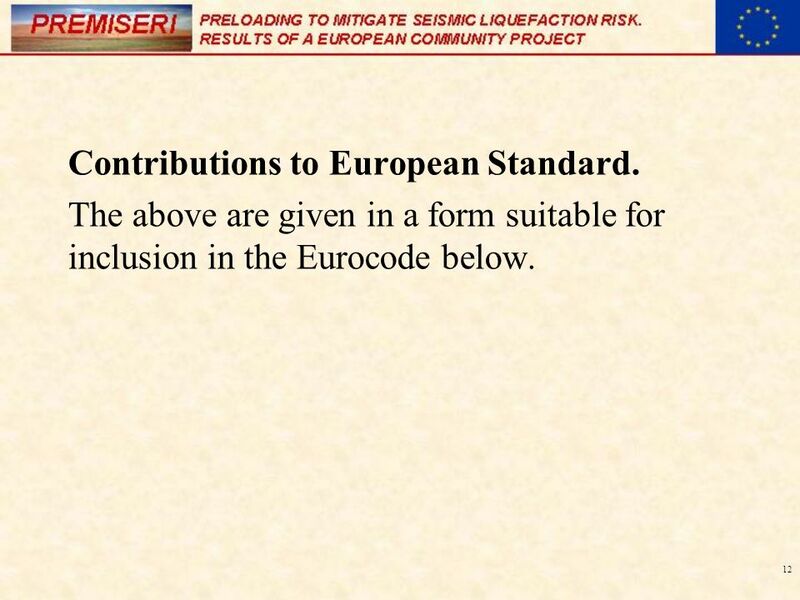 The above are given in a form suitable for inclusion in the Eurocode below. 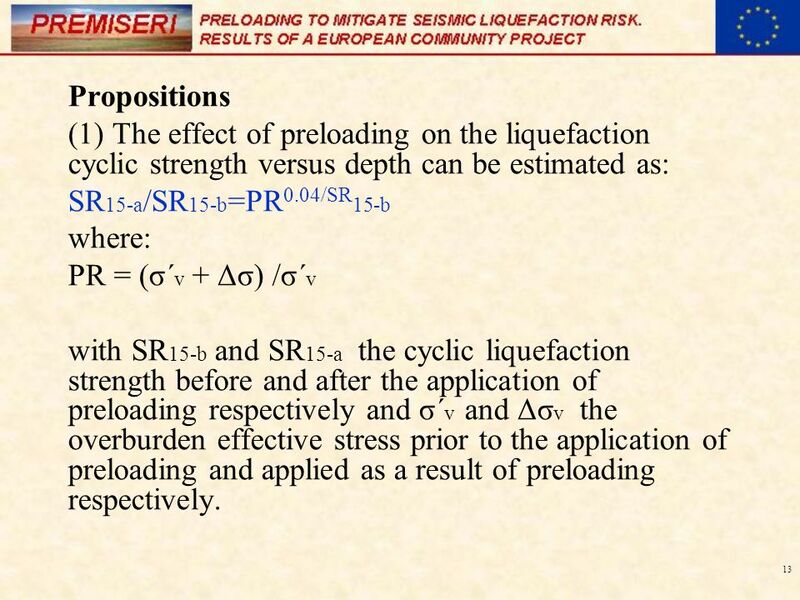 13 13 Propositions (1) The effect of preloading on the liquefaction cyclic strength versus depth can be estimated as: SR 15-a /SR 15-b =PR 0.04/SR 15-b where: PR = (σ΄ v + Δσ) /σ΄ v with SR 15-b and SR 15-a the cyclic liquefaction strength before and after the application of preloading respectively and σ΄ v and Δσ v the overburden effective stress prior to the application of preloading and applied as a result of preloading respectively. 14 14 (2) The effect of preloading on the shear wave velocity can be estimated as: where k is a factor that depends on the Plasticity Index (PI). For PI=0, 20, 40, 60, 80, k equals 0, 0.18, 0.30, 0.41 and 0.48 respectively. The factors OCR bef and e bef can be obtained from the geotechnical investigation of the site prior to the application of preloading. The factor OCR after can be obtained by obtaining the vertical stress induced by preloading using elastic theory. The k o-bef and k o-after values can be estimated using the Mayne and Kulhaway (1982) empirical relationship. The e after can be obtained from estimating the change in void ratio induced by preloading using 1-dimensional compression theory and values of the virgin and swelling coefficients of compressibility of the soil layers. 15 15 (3) Installation of pore pressure transducers to measure the pore pressures is very important in order to illustrate risk of failure during preload embankment construction on soft clay layers. The following equation can be used: FS(t-i) = 0.2 (σv(t-i) -P(t-i) ) / (A γe H t ) where γ e is the unit weight of the clay layer and the embankment, H t is the time dependent height of the embankment, σ' v is the in-situ effective vertical stress that can be estimated from elastic theory, A is a factor that depends on the height of embankment and surface layer thickness and inclination of the slope of the embankment as given in the figure. The subscript t indicates variation in terms of time and the subscript (t-i) indicates variation in terms of location and time. Application of the above equation needs pore pressure measurements, while the total vertical stress can be estimated from solutions of linear elasticity. This equation provides an estimate of the local factor of safety versus time of construction. In the case FS (t-i) equals 1.1, construction should stop until excess pore pressures are dissipated. Download ppt "1 MAJOR FINDINGS OF THE PROJECT AND THEIR POSSIBLE INCLUSION IN EUROPEAN STANDARD -Major findings -Major findings suitable for inclusion in European Standard." Numerical analysis of the effect of preloading on the seismic risk of buildings on liquefaction-susceptible sites F. Lopez-Caballero, A. Modaressi and. Impacts of Seismic Stress on Pore Water Pressure in Clayey Soil By: Qazi Umar Farooq Lecturer Civil Engineering Dept Univ of Engg & Tech Taxila. In Situ Testing CPT & SPT.